Coach and Peanuts have joined forces for a very adorable capsule collection that’s available at Colette Paris today. 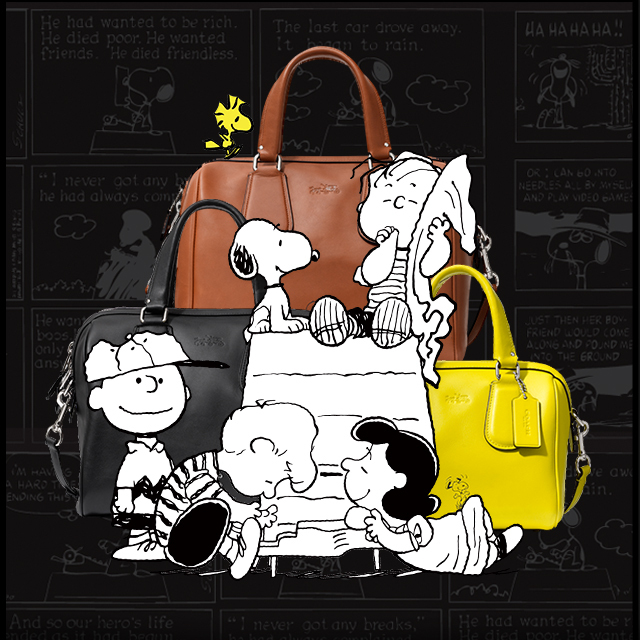 Creative Director Stuart Vevers took Peanuts creator Charles M. Schulz‘s iconic characters and superimposed them onto Coach’s buttery leather bags. The limited-edition range adds a whimsical take on the brand’s sturdy, classic pieces. Duffel bags, totes and crossbodies are embossed with tiny renderings of the Peanuts gang, though Snoopy and his avian friend Woodstock are the true stars of this collaboration. Their likenesses cover most of the pieces, which are rendered in hues of ivory, black, brown and “Woodstock Yellow.” In addition to handbags, you’ll also find luggage tags, coin purses, bookmarks and wallets. The brand has also created T-shirts and a black leather stuffed Snoopy, coming in a range of sizes. Colette is debuting the collection today, but the collab is expected in Coach stores by November 1. The range will be available at Coach.com on October 24, although the brand will be releasing its first app two days before, which will feature a program that allows you to get photobombed by the Peanuts gang. Check out the range at Colette now.